The Whining Whiners Who Whine™ lost their minds this weekend. I speak specifically of the the Whining Whiners Who Whine™ of Game On for Kansas Schools. 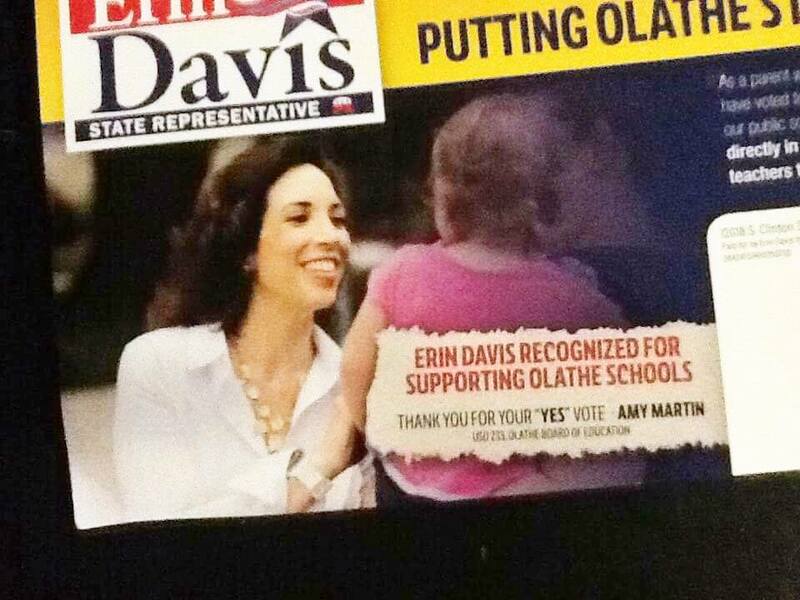 Rep. Erin Davis sent a mailer with a quote from Olathe Board of Education member, Amy Martin, on it. The quote was from an email to the entire Olathe legislative delegation. It read: "Thank you for your 'yes' vote." Did Martin write that in an email that was sent to Davis? Yep. Does the mailer say Martin "endorses" Davis? Nope. The mailers reached mailboxes sometime late last week, and Martin took to the childishly named GameOn Facebook page to act like a kid caught with her hand in the cookie jar. "I did not give permission for this and I do not endorse her candidacy... I thanked those Olathe senators and representatives who voted yes on HB2001 and Rep. Davis was among them... Students were able to continue receiving critical services and teachers continued to get paid and didn't have their healthcare jeopardized. For that I was thankful," Martin wrote. It's almost as if that's what the postcard said--that she thanked Davis. And then Martin went on to write about the stuff her mother taught her about saying thank you. Seriously, when anyone trots out self-righteous lines about their mothers (or, bless his heart and no offense, K.Yo, their grandmothers), wise people tune out. They're not about to hear facts; they're about to hear a folksy opinion. It's like the idea of hanging out in a wheat field. Sounds really romantic--the smell of wheat, a bright sunny day. And then you get out there and sweat to death and get eaten alive by mosquitoes and sink in the mud. I have a feeling this feigned outrage is going to continue throughout the next few weeks. Over at highly-paid attorneys and corporations fronted by soccer moms for Blue Valley Schools, the district administration is issuing Facebook statements clarifying that its thank you notes to legislators isn't an endorsement. Serious question: If voters don't understand the difference between a thank you and an endorsement, should children be taught the meaning of words in government schools? Asking for a friend. There was nothing dishonest about the postcard, but there's a whole lot of dishonest about the way the Game On folks are behaving. It's like they think this is afternoon tea, and not politics. If you're an elected official, like Martin is, and you send a bunch of other elected officials an email, you shouldn't be surprised if your words are used somewhere down the line. This isn't preschool. For those who'd like the actual truth about what happened in Topeka in the waning hours of the legislative special session: Here it is one more time: A number of Johnson County representatives and senators worked overtime beside superintendents of many JoCo schools to come up with a solution that all parties could live with. Meanwhile, the only part the so-called mods played was stirring the pot. Literally, they did nothing but tweet. They weren't looking for solutions. They were looking to torpedo the process. Their goal was to get the schools closed so they could blame conservatives and eventually force them to vote for a tax increase. It's called politics. I don't really like how it's played, but that's the game, and I don't set the rules. Johnson County conservatives, particularly people like Ron Ryckman, went out of their way to ensure Johnson County schools got their funding. As far as I'm concerned, they negotiated with hostage takers, but the end result was schools will be open and no schools received a cut. That's a miracle, friends, a miracle pulled off by some of the exact same people these Game On for schools people are excoriating. The Whining Whiners Who Whine™ need to decide whether they are serious about school funding and The Children, or whether the only thing that matters is getting their friends elected. Many of the conservatives they are vomiting lies and misconceptions about today are going to be back in Topeka come January. It's going to be a tough session, and cuts will be made. That's not a threat. That's simply an economic reality. Compromise will be a requirement, but I can't see any good reason to compromise with people who will do and say anything to stick a knife in their backs. My concern about Game On, which is supposed to care about children, is that they're too cozy with KNEA. If a teacher sexually molests a student, who do the KNEA lawyers defend? Any group that claims to care about the interests of children would distance themselves from teacher unions. I understand the reason for teacher unions, but let's be realistic and honest about their motives.